This walkthrough explains how user permissions work with Amazon S3. We will create a bucket with folders, and then we'll create AWS Identity and Access Management users in your AWS account and grant those users incremental permissions on your Amazon S3 bucket and the folders in it. When you create the Development folder, the console creates an object with the key Development/. Note the trailing '/' delimiter. When you upload an object named Projects1.xls in the Development folder, the console uploads the object and gives it the key Development/Projects1.xls. In the key, Development is the prefix and '/' is the delimiter. The Amazon S3 API supports prefixes and delimiters in its operations. For example, you can get a list of all objects from a bucket with a specific prefix and delimiter. In the console, when you double-click the Development folder, the console lists the objects in that folder. In the following example, the Development folder contains one object. When the console lists the Development folder in the companybucket bucket, it sends a request to Amazon S3 in which it specifies a prefix of Development and a delimiter of '/' in the request. The console's response looks just like a folder list in your computer's file system. The preceding example shows that the bucket companybucket has an object with the key Development/Projects1.xls. The console is using object keys to infer a logical hierarchy; Amazon S3 has no physical hierarchy, only buckets that contain objects in a flat file structure. When you create objects by using the Amazon S3 API, you can use object keys that imply a logical hierarchy. When you create a logical hierarchy of objects, you can manage access to individual folders, as we will do in this walkthrough. These object keys create a logical hierarchy with Private, Development and the Finance as root-level folders and s3-dg.pdf as a root-level object. When you click the bucket name in the Amazon S3 console, the root-level items appear as shown. The console shows the top-level prefixes (Private/, Development/ and Finance/) as root-level folders. The object key s3-dg.pdf has no prefix, and so it appears as a root-level item. You create a bucket and then add three folders (Private, Development, and Finance) to it. You have two users, Alice and Bob. You want Alice to access only the Development folder and Bob to access only the Finance folder, and you want to keep the Private folder content private. In the walkthrough, you manage access by creating AWS Identity and Access Management (IAM) users (we will use the same user names, Alice and Bob) and grant them the necessary permissions. IAM also supports creating user groups and granting group-level permissions that apply to all users in the group. This helps you better manage permissions. For this exercise, both Alice and Bob will need some common permissions. So you will also create a group named Consultants and then add both Alice and Bob to the group. You will first grant permissions by attaching a group policy to the group. Then you will add user-specific permissions by attaching policies to specific users. The walkthrough uses companybucket as the bucket name, Alice and Bob as the IAM users, and Consultants as the group name. Because Amazon S3 requires that bucket names be globally unique, you will need to replace the bucket name with a name that you create. In this example, you will use your AWS account credentials to create IAM users. Initially, these users have no permissions. You will incrementally grant these users permissions to perform specific Amazon S3 actions. To test these permissions, you will sign in to the console with each user's credentials. As you incrementally grant permissions as an AWS account owner and test permissions as an IAM user, you need to sign in and out, each time using different credentials. You can do this testing with one browser, but the process will go faster if you can use two different browsers: use one browser to connect to the AWS Management Console with your AWS account credentials and another to connect with the IAM user credentials. To sign into the AWS Management Console with your AWS account credentials, go to https://console.aws.amazon.com/. An IAM user cannot sign in by using the same link. An IAM user must use an IAM-enabled sign-in page. As the account owner, you can provide this link to your users. For more information about IAM, go to The AWS Management Console Sign-in Page in the IAM User Guide. In the Navigation pane, click IAM Dashboard . Note the URL under IAM users sign in link:. You will give this link to IAM users to sign in to the console with their IAM user name and password. In this step, you will sign in to the Amazon S3 console with your AWS account credentials, create a bucket, add folders (Development, Finance, Private) to the bucket, and upload one or two sample documents in each folder. Upload one document to the bucket. This exercise assumes you have the s3-dg.pdf document at the root level of this bucket. If you upload a different document, substitute its file name for s3-dg.pdf. Add three folders named Private, Finance, and Development to the bucket. For step-by-step instructions to create a folder, go to Creating a Folder in the Amazon Simple Storage Service Console User Guide. Upload one or two documents to each folder. For step-by-step instructions, see How Do I Upload Files and Folders to an S3 Bucket? in the Amazon Simple Storage Service Console User Guide. Now use the IAM console to add two IAM users, Alice and Bob, to your AWS account. Also create an administrative group named Consultants, and then add both users to the group. When you add users and a group, do not attach any policies that grant permissions to these users. At first, these users will not have any permissions. In the following sections, you will incrementally grant permissions. You must first ensure that you have assigned passwords to these IAM users. You will use these user credentials to test Amazon S3 actions and verify that the permissions work as expected. For step-by-step instructions on creating a new IAM user, see Creating an IAM User in Your AWS Account in the IAM User Guide. When you create the users for this walkthrough, check "AWS Management Console access" and leave "Programmatic access" unchecked. For step-by-step instructions on creating an administrative group, see Creating Your First IAM User and Administrators Group section in the IAM User Guide. If you are using two browsers, you can now use the second browser to sign into the console using one of the IAM user credentials. Using the IAM user sign-in link (see To Provide a Sign-in Link for IAM Users), sign into the AWS console using either of the IAM user credentials. Verify the following console message telling you that access is denied. Now, let's begin granting incremental permissions to the users. First, you will attach a group policy that grants permissions that both users must have. List all buckets owned by the parent account. To do so, Bob and Alice must have permission for the s3:ListAllMyBuckets action. List root-level items, folders, and objects, in the companybucket bucket. To do so, Bob and Alice must have permission for the s3:ListBucket action on the companybucket bucket. Now we'll create a policy that grants these permissions and then we'll attach it to the Consultants group. In this step you'll create a managed policy that grants the users minimum permissions to enable them to list all buckets owned by the parent account and then you'll attach the policy to the Consultants group. When you attach the managed policy to a user or a group, you allow the user or group permission to obtain a list of buckets owned by the parent AWS account. Since you'll be granting user permissions, sign in with your AWS account credentials, not as an IAM user. In the navigation pane on the left, click Policies and then click Create Policy. A policy is a JSON document. In the document, a Statement is an array of objects, each describing a permission using a collection of name-value pairs. The preceding policy describes one specific permission. The Action specifies the type of access. In the policy, the s3:ListAllMyBuckets is a predefined Amazon S3 action. This action covers the Amazon S3 GET Service operation, which returns list of all buckets owned by the authenticated sender. The Effect element value determines if specific permission is allowed or denied. Click Review Policy. On the next page, enter AllowGroupToSeeBucketListInTheConsole in the Name field, and then click Create policy. The Summary entry will display a message stating that the policy does not grant any permissions. For this walkthrough, you can safely ignore this message. Attach the AllowGroupToSeeBucketListInTheConsole managed policy that you created to the Consultants group. For step-by-step instructions for attaching a managed policy, see Adding and Removing IAM Policies (Console) in the IAM User Guide. You attach policy documents to IAM users and groups in the IAM console. Because we want both our users to be able to list the buckets, we attach the policy to the group. Using the IAM user sign-in link (see To Provide a Sign-in Link for IAM Users), sign into the AWS console using any one of IAM user credentials. The console should now list all the buckets but not the objects in any of the buckets. Now let's allow all users in the Consultants group to list the root-level companybucket bucket items. 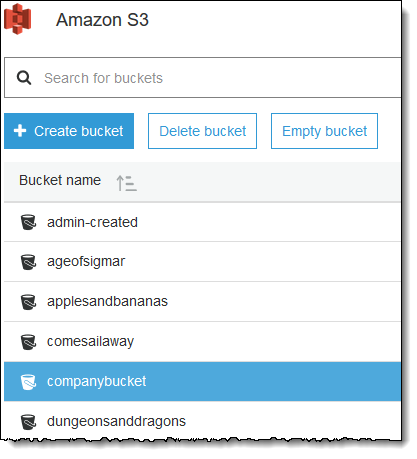 When a user clicks the company bucket in the Amazon S3 console, he or she will be able to see the root-level items in the bucket. Remember, we are using companybucket for illustration. You must use the name of the bucket that you created for this exercise. To understand what request the console sends to Amazon S3 when you click a bucket name, the response Amazon S3 returns, and how the console interprets the response, it is necessary to take a little deep dive. prefix parameter with an empty string as its value. delimiter parameter with / as its value. The key s3-dg.pdf does not contain the '/' delimiter, and Amazon S3 returns the key in the <Contents> element. However, all other keys in our example bucket contain the '/' delimiter. Amazon S3 groups these keys and returns a <CommonPrefixes> element for each of the distinct prefix values Development/, Finance/, and Private/ that is a substring from the beginning of these keys to the first occurrence of the specified '/' delimiter. The console interprets this result and displays the root-level items as three folders and one object key. prefix parameter with value Development/. delimiter parameter with '/' value. In response, Amazon S3 returns the object keys that start with the specified prefix. Now, let's return to granting users permission to list the root-level bucket items. To list bucket content, users need permission to call the s3:ListBucket action, as shown in the following policy statement. To ensure that they see only the root-level content, we add a condition that users must specify an empty prefix in the request—that is, they are not allowed to double-click any of our root-level folders. Finally, we will add a condition to require folder-style access by requiring user requests to include the delimiter parameter with value '/'. Use your AWS account credentials, not the credentials of an IAM user, to sign in to the console. Replace the existing AllowGroupToSeeBucketListInTheConsole managed policy that is attached to the Consultants group with the following policy, which also allows the s3:ListBucket action. Remember to replace companybucket in the policy Resource with the name of your bucket. For step-by-step instructions, see Editing Customer Managed Policies in the IAM User Guide. When following the step-by-step instructions, make sure to follow the directions for applying your changes to all principal entities that the policy is attached to. Using the IAM user sign-in link (see To Provide a Sign-in Link for IAM Users), sign in to the AWS Management Console. Click the bucket that you created for this exercise, and the console will now show the root-level bucket items. If you click any folders in the bucket, you will not be able to see the folder content, because you have not yet granted those permissions. This test succeeds when users use the Amazon S3 console because when you click a bucket in the console, the console implementation sends a request that includes the prefix parameter with an empty string as its value and the delimiter parameter with '/' as its value. List all buckets owned by the parent account. See root-level items in the companybucket bucket. Permit Alice to get and put objects in the Development folder. Permit Bob to get and put objects in the Finance folder. For user-specific permissions, you attach a policy to the specific user, not to the group. In the following section, you grant Alice permission to work in the Development folder. You can repeat the steps to grant similar permission to Bob to work in the Finance folder. Now we grant additional permissions to Alice so she can see the content of the Development folder and get and put objects in that folder. For Alice to list the Development folder content, you must apply a policy to the Alice user that grants permission for the s3:ListBucket action on the companybucket bucket, provided the request includes the prefix Development/. Because we want this policy to be applied only to the user Alice we'll use an inline policy. For more information about inline policies, see Managed Policies and Inline Policies in the IAM User Guide. Create an inline policy to grant the user Alice permission to list the Development folder content. Click the user name Alice. On the user details page, select the Permissions tab and then click Add inline policy. Click Review Policy. On the next page, enter a name in the Name field, and then click Create policy. Using the IAM user sign in link (see To Provide a Sign-in Link for IAM Users), sign in to the AWS Management Console. In the Amazon S3 console, verify that Alice can see the list of objects in the Development/ folder in the bucket. 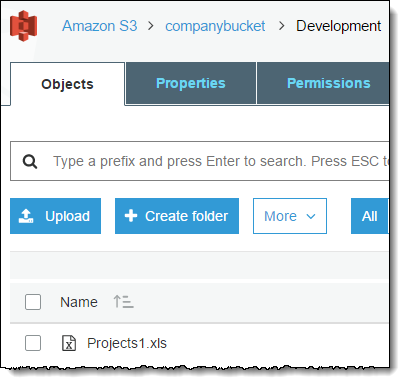 When the user clicks the /Development folder to see the list of objects in it, the Amazon S3 console sends the ListObjects request to Amazon S3 with the prefix /Development. Because the user is granted permission to see the object list with the prefix Development and delimiter '/', Amazon S3 returns the list of objects with the key prefix Development/, and the console displays the list. For Alice to get and put objects in the Development folder, she needs permission to call the s3:GetObject and s3:PutObject actions. The following policy statements grant these permissions, provided the request includes the prefix parameter with a value of Development/. Edit the inline policy you created in the previous step. On the user details page, select the Permissions tab and then expand the Inline Policies section. Click Edit Policy next to the name of the policy you created in the previous step. Using the IAM user sign-in link (see To Provide a Sign-in Link for IAM Users), sign into the AWS Management Console. 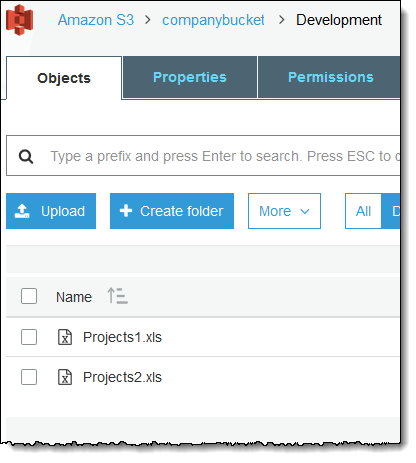 In the Amazon S3 console, verify that Alice can now add an object and download an object in the Development folder. User Alice can now list the root-level content in the companybucket bucket. She can also get and put objects in the Development folder. If you really want to tighten the access permissions, you could explicitly deny Alice access to any other folders in the bucket. If there is any other policy (bucket policy or ACL) that grants Alice access to any other folders in the bucket, this explicit deny overrides those permissions. You can add the following statement to the user Alice policy that requires all requests that Alice sends to Amazon S3 to include the prefix parameter, whose value can be either Development/* or an empty string. Note that there are two conditional expressions in the Condition block. The result of these conditional expressions is combined by using the logical AND. If both conditions are true, the result of the combined condition is true. Because the Effect in this policy is Deny, when the Condition evaluates to true, users will not be able to perform the specified Action. The Null conditional expression ensures that requests from Alice include the prefix parameter. The prefix parameter requires folder-like access. If you send a request without the prefix parameter, Amazon S3 returns all the object keys. If the request includes the prefix parameter with a null value, the expression will evaluate to true, and so the entire Condition will evaluate to true. You must allow an empty string as value of the prefix parameter. From the preceding discussion, recall that allowing the null string allows Alice to retrieve root-level bucket items as the console does in the preceding discussion. For more information, see Step 4.2: Enable Users to List Root-Level Content of a Bucket. The StringNotLike conditional expression ensures that if the value of the prefix parameter is specified and is not Development/*, the request will fail. Follow the steps in the preceding section and again update the inline policy you created for user Alice. Now you want to grant Bob permission to the Finance folder. 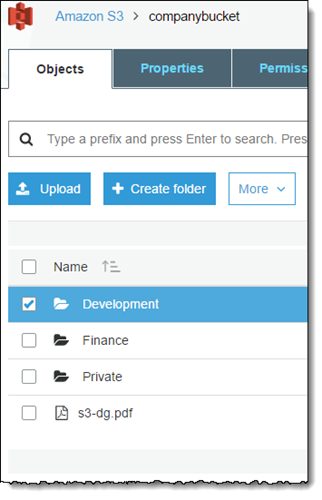 Follow the steps you used earlier to grant permissions to Alice, but replace the Development folder with the Finance folder. For step-by-step instructions, see Step 5: Grant IAM User Alice Specific Permissions. Add the following statement to explicitly deny any action on resources in the Private folder (companybucket/Private/*). You also deny permission for the list objects action when the request specifies the Private/ prefix. In the console, if Bob or Alice double-clicks the Private folder, this policy causes Amazon S3 to return an error response. Replace the Consultants group policy with an updated policy that includes the preceding deny statements. After the updated policy is applied, none of the users in the group will be able to access the Private folder in your bucket. Replace the existing AllowGroupToSeeBucketListInTheConsole managed policy that is attached to the Consultants group with the following policy. Remember to replace companybucket in the policy with the name of your bucket. For instructions, see Editing Customer Managed Policies in the IAM User Guide. When following the instructions, make sure to follow the directions for applying your changes to all principal entities that the policy is attached to. In order to clean up, go to the IAM console and remove the users Alice and Bob. For step-by-step instructions, go to Deleting an IAM User in the IAM User Guide. To ensure that you aren't charged further for storage, you should also delete the objects and the bucket that you created for this exercise . Working with Policies in the IAM User Guide.